Good old vav. Vav ו is the 6th letter of the Hebrew alphabet. It derives from the Hebrew word vav וו, meaning hook or peg. 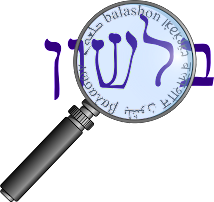 The letter looks like the word (the letter in ancient script - and ancient hooks - looked more like a letter Y, or as Rashbam on Shmot 26:32 says, "a fork"), the word is made up of only that letter, and it's practically the only Biblical Hebrew word that begins with that letter. What a great package. Does everything have to be complicated?